ROUGH CRAFTS BLOG » ROUGH CRAFTS IRON GUERILLA on 知名機車網站BIKE EXIF!! ROUGH CRAFTS IRON GUERILLA on 知名機車網站BIKE EXIF!! Of all the Asian countries, Japan has the highest profile in the custom scene, and has even exported the whole genre of SR400 modifications. But other countries are getting more press now, with Australian shop Deus moving into Bali and the whole Indonesian scene gaining momentum. Now it looks like the turn of Taiwan, helped by classy new magazines such as Free Biker. This hunkered-down Sportster custom is called Guerrilla: it’s just graced the pages of Free Biker, and comes from an upstart new Taipei shop called Rough Crafts. According to builder Winston Yeh, “The initial idea for this bike was to get it to look custom, without being too ‘far out’—because Taiwan has a crazy regulation that all bikes bigger than 250cc have to pass an annual exam after they are older than five years. The bike is compared to the stock picture and if it looks too different, it will be hard to pass. With that in mind, I tried to create a bike that has similar profile to stock. 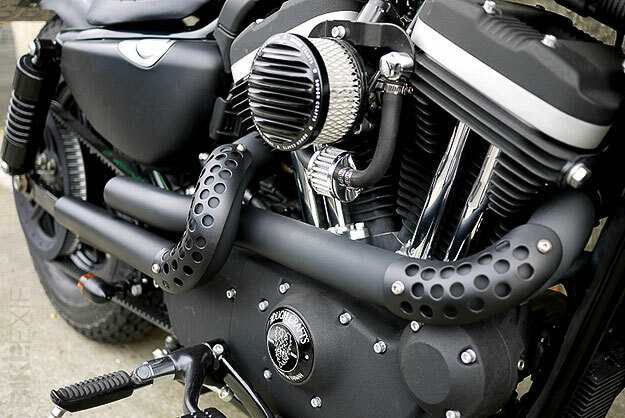 So you probably think it’s ‘normal’ from far away, but you can see the customization when up close.” The bike takes Harley’s Nightster theme a step further, with a chopped front end, new bars, bodywork and lighting—and a terrific exhaust system that adds to the compact, muscular vibe. Excellent work from a builder worth keeping an eye on, so check out Rough Crafts’ blog for regular updates. 08 Aug This entry was written by Winston, posted on August 8, 2010 at 6:25 pm, filed under Uncategorized. Bookmark the permalink. Follow any comments here with the RSS feed for this post. Post a comment or leave a trackback: Trackback URL. Older: ROUGH CRAFTS Megan’s 883Low in SHANGHAI complete!! I love this bike Winston. Is that just a stock 16″ rear mag wheel placed on the front end? Could you work me up a price for that tripletree conversion, and will it work with stock Iron forks? Is your suspension lowered? I’d also like any pricing on that seat, rear fender setup. I must agree with all the comments on this blog, amazing bike. Just a quick question how was the ride with the larger front tire and do you have a spec list of what you added and took away, and a price list for the custom parts you added. Cool bike! I’ve been looking at pictures of your bike for a couple of days now, and i need to apply some of your style to my ‘98 sporty. I have a wide glide conversion on the front, so I think I can add the larger tire with little trouble. I could use a little info on how you were able to fit the large tire on the rear and still keep the belt drive. Could you also clairify the tire size and manufacture? Thank you. Heya Winston. Man what a beautiful design. I came across your blog ages ago and somehow landed on it again and am once again stunned by the quality in this build. Am wanting to know what the cost and process is of ordering that front grill for the headlight. The pipes & heat shields. And finally the air cleaner. Thanks for your time and beautiful work! What do I need to install those tires on my Iron 883.
hello once again winston, well i still didn’t get my reply so was wondering.could you tell me how much would it cost to customize iron 883 into gurellia. Ur reply is highly appreciated.by the way i am from NEPAL and if i get a reasonable quote from you then i will provide you the HD iron 883 in Taiwan and you could customize the same gurellia for me. Heya…. bloody sweeet ride mate! Seriously…. how much for this bad boy? Or is it a special one off…. I want to buy your exhaust pipes, tank and handlebars for my Sportster you send me the cost and how you can buy. can you build the same for me? Hello Winston,I’d like to purchase all the parts to build a Iron Gurellia out off a sportster, do you sell to the public? How can I get in direct contact with your company to purchase pipes, fuel tank, triple trees etc. How can I contact you guys? I am in Boston and looking to get a custom gas tank for my 2010 883 Irion. Hi dear, I have a regular 08 XL883 with a chopped rear fender refit(60236-09BEO), I am looking to get a seat. tks. I’d love to have those exhaust for my HD’48. Please contact me with info on price and shipping to Europe. This bike is SICK. how much would it cost me to convert my 2012 883 to look like this? I live in California. Thanks. Hi Winston… How much this beautiful bike?? nice bike! i would love to know the prices of your air cleaner and headlamp grill. please let me know how i can buy these products from rough crafts . Awesome bike.. Beautifully design. I would like to get the air cleaner and grilled headlights.. would also like to get the tank and pipes? Please let me know why to get the rough craft parts? 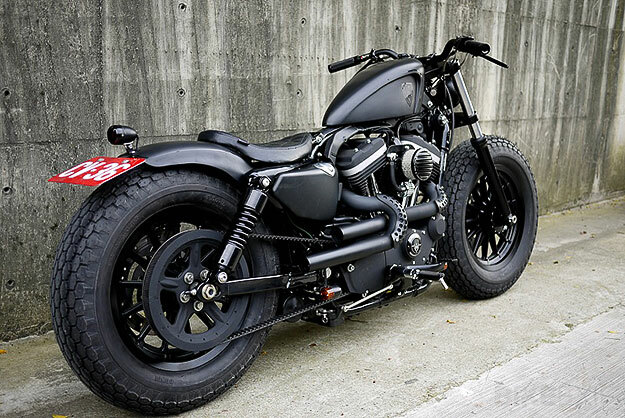 That is the baddest looking Iron 883 I have ever seen. 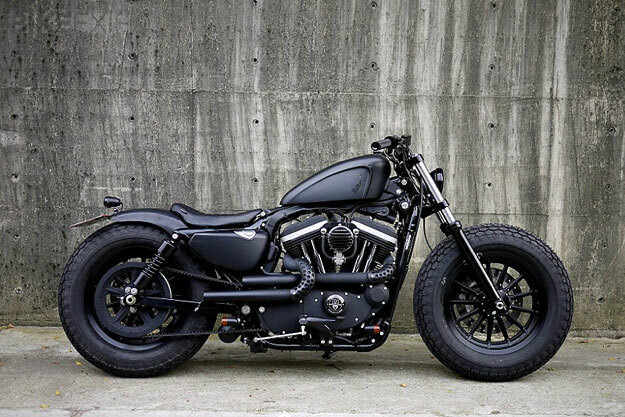 Do you sell all the parts to make an Iron 883 look like this one? It’s incredible the bike. 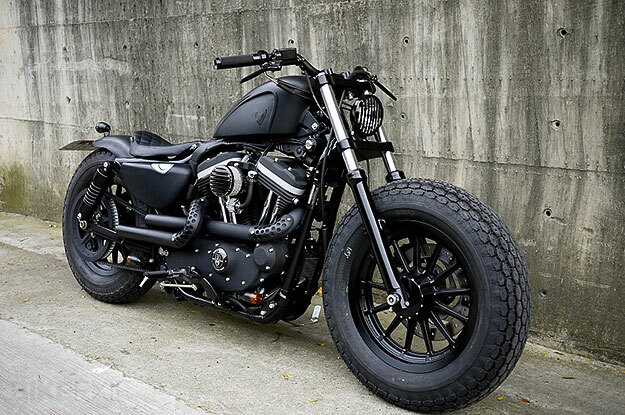 I’ve an iron 883 and I want to customize it as your. Is it possible you order parts? Do you sell all the parts to make an Iron 883 look like this one? juste to telle you that http://www.roughcrafts.com/rough_hard_parts.html doensn’t seem to be ok. We can’t look anything. So How can i know about price of the parts you make? I am just blown away by the craftsmanship and detail in this bike. It is absolutely amazing! I would like to know if you are marketing and or selling any of the parts for this bike? I am interested in the quite a few. Interested in some parts for this bike if you guys are selling some parts? Hi mate, i’m very interested in your Guerrilla Iron. I have 883 R and i would like to put some of yours parts….is it possible to have the prices for the exhaust and the wheels.What about their dimension?Are them 16″ both?And can i know the type of pneumatics you used?Thank and regards.I’m from Europe so please give me the price also for the shipment. What a work of art, I love everything about Your creation. Please can you send me a price list for all additional Rough Crafts parts. 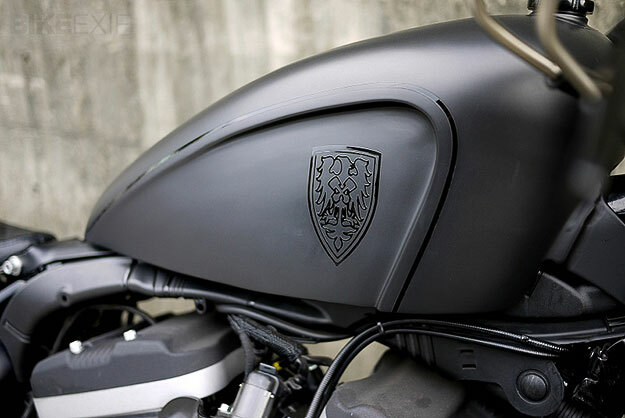 I live in Switzerland, and i have an iron 883N, i’m interested to order u the air filter the same as these pictures, is it possible? please tell me on my e-mail adress. HELLO WINSTON IF POSSIBLE COULD I HAVE A PARTS PRICE LIST FOR THE CUSTOM PARTS ON THIS BIKE,MANY THANKS ANDREW. How can I buy some of your parts??? That’s a great looking bike. I’d like to purchase the diamond stitched solo seat. Please contact me at the email address provided. Big fan of your work. 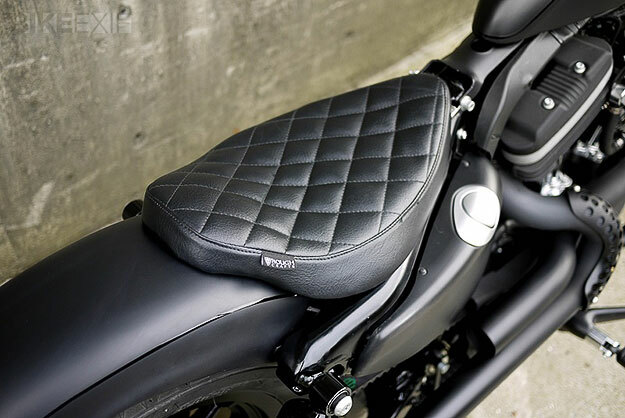 Looking to put Rough Crafts’ Diamond stitched solo seat on my HD 48. Would much appreciate it if you could send more info so I can purchase. Thanks and much luck with future builds! Congratulations for your work. i would like to know how may i buy your crafts from Spain, but also i got a doubt about my iron because is from 2009 and i would like to replace the seat, the problem as you should know is the switchboard under the seat, does your seat cover totally this switchboard? ?